There are many customs and traditions in the Philippines we don’t fully understand, yet we keep practicing them anyway simply because that’s how it’s been done ever since; so we simply accept that it will always have to remain that way. What are traditions anyway? They are just man-made practices invented by people long ago who don’t know any better than us in this modern age. Many of these traditions are actually meaningless or obsolete. We need to ask the deeper question: why do we keep doing these things in the first place? Many Filipino customs and traditions are in fact detrimental to the financial health of families. There are those that also cause undue stress and trouble to the community. These harmful practices need to be phased out. As radical no-nonsense President Rodrigo Duterte likes to say about bad things Filipinos do: STOP IT! These customs and traditions that contribute nothing to our advancement must see the beginning of their end. Many people however cannot stop things abruptly. We should at least take the first steps to bringing about the full eradication of such unwanted baggage. Fiestas. 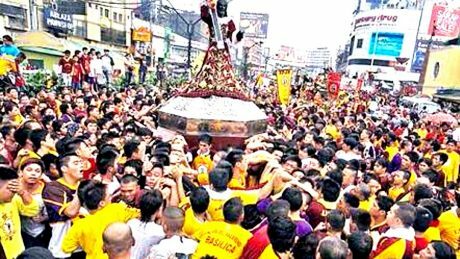 Filipinos celebrate the patron saint of their community, but can’t even tell if the dead saint appreciates all their preparations. Financially constrained families have to borrow money to fund this event even as they struggle to pay the tuition of 5 kids, just to save face when relatives pour in to feast over their costly banquet. To help cover expenses, some barangays even have a road-spanning-rope checkpoint to collect “taxes” or forced “donations” from every vehicle passing through. Birthday blowouts. It makes people dread the day of their birth because they are coerced by peer pressure and social expectations to throw an all-expense paid party or dine-out meal for friends. Birthdays should instead be celebrated with friends chipping in to give the celebrant an all-expense-paid treat. Now wouldn’t that be something to look forward to? Caroling with solicitations. It’s a total loss of the spirit of Christmas (voluntary giving) when people sing in front of your house with the express purpose of extorting (demanding) payment for their unsolicited entertainment services. In some houses, people even turn their lights off just to ward off these annoyances. Maybe it’s why Christmas season is longest in this country – the longer the period for making extra money by legalized extortion. Long processions for funerals. Blocking a road for a slow funeral procession causes significant trouble to the entire community, especially if there are no parallel roads to bypass these annoying mourners. Some of these people even close off an entire street to set up tables for the wake that could last several days. Late-night karaoke. Filipinos love to sing. However, children need to study and sleep soundly at night. How can people focus or enjoy peace and quiet to recharge for the next day when callous insensitive wannabe performers show no consideration for neighbors with all the sound pollution they create? Sunday mass for hypocrites. Don’t get me wrong. I’m not against going to church to learn good values. But Filipinos should just skip going to mass IF they take a special time to listen to a priest on Sunday only to spend the rest of the week lying, stealing, scamming and cheating. It would be better use of their time if they just visited the poor and sick, bringing with them some fruits to have good warm fellowship over. Most Filipinos have lost the essence of Christianity and replaced it with building-focused institutions with programs that revolve around human traditions and entertainment. New year firecrackers. Do large sonic bangs really scare away evil spirits as we welcome the coming of a new year? O really? Then in which direction did the spirit go to run away from you? Is it really worth losing your fingers, risking setting a neighborhood on fire or having a little girl’s head blown by a stray bullet falling through the roof just to proclaim “Happy New Year!”? Extravagant weddings. Filipinos are in the game of outdoing each other. There is too much pressure on those who want to tie the knot to give an impressive show to all the relatives and friends they invite over to their wedding. New couples should not spend too much on a ceremony, but instead just use their savings as seed money for building their new life together. Ninongs and ninangs are not even needed; they actually only feel coerced when asked. Gifts should be in cash, and not large boxes containing worthless things such as a punch bowl. It’s time for a cool change in the land of dysfunctional zombies. President Duterte is boldly straightening out the crooked road left by his predecessors by removing encumbrances and senseless practices in Philippine society. Measures to address items 5 and 7 will soon be set for nationwide adoption. Anything unnecessary that only makes life difficult for Filipinos should go away. Be different; be a trail blazer by going against the grain in starting to stop many of our senseless practices. Why not get married far away in a remote beach with just close loved ones invited to reduce expenses? Why not just have simple lumpia and banana cue for the reception? People will even be grateful they didn’t get tempted to pack on too many calories. Filipinos should really ask themselves why they put up with all the social pressure to be like everyone else. One of my favorite expressions these days is “common sense lang yan”. Common sense is simple: Whatever you see typical Filipinos doing -> simply do the opposite. Many customs and traditions have only served to imprison Filipinos. It’s time to open the cage and truly fly free. Remember it wasn’t Cory who set Filipinos free; the key to your freedom can be found in one simple word: “STOP”. Note: Introductory story – compliments of a pastor I could no longer recall. Previous Article Are we just gonna leave the Opposition to the Yellowtards to run? Personally the only 1 of the 8 things on the list that I don’t have a problem with is the last 1. People only get married once and if, like in America, it is the custom for the bride’s family to pay for the wedding, then they should have as nice an event as they can AFFORD. Generally the groom’s family hosts the rehearsal dinner and that also should be a nice event that does not leave the guests hungover for the wedding the next day. Fiestas are a waste of time and money while doing nothing but causing inconveniences for people who need to get to work around all the parades and party activities. Birthday parties should be cooperative efforts of friends and family, not the honoree and I see hard working people waste money they need to spend on their family giving fiesta style birthday parties for themselves. All those parties do is “invite” all the outlaw relatives and neighbors to come get a free meal. I NEVER give money to carolers these days, partly because where I live they can’t really find my house. When I lived in Bukidnon I had a habit of marking the hands of children and giving them a small gift once a day and never gave anything to the obvious Muslims and Lumads who were not Christians, just beggars. Funeral processions might have been appropriate in the days of horses and carabao cart traffic in villages where everyone knew everyone else and a death was a community event. These days, all such processions do is disrupt traffic and inconvenience people who are not involved. In civilized countries the police block roads and manage traffic so as to get the funeral through an area in the most efficient manner and as quickly as possible to cause the least possible disruption to commerce as possible. Late night karaoke is nothing but rude, childish, uncaring, inconsiderate stupid behavior. People sometimes need to sleep so they can get up for school or work in the morning and drunks doing loud karaoke all night certainly is not conducive to a productive day the next day. I like music as much as the next person, but “Filipino love song” crap music is terrible to start with, but gets exponentially worse with every bottle of Tandhuay. If people want to go to church, then go ahead, but because there is no god, you are wasting your time, giving hard earned (in some cases) money to organizations who should be heavily taxed, not given money and then allowed to operate tax free. The attendance at weekly services does nothing for the general public but cause excessive traffic and necessitates the use of publicly funded traffic control for a useless exercise. Firecrackers should be outlawed entirely and the parents of any child injured by family fireworks should have the exact same injury intentionally inflicted on them. A child loses an eye, the parents lose eyes (without anesthesia). A child blows off his hand with a firecracker, the parents have to hold an exploding firecracker and so on. Senator Raul Manglapus who run for the presidency as a 3rd party candidate against Marcos and Macapagal in 1965 was the first one who suggested the abolition of fiestas because of the financial waste as elaborated in the above article. Senator Manglapus was also the first one who advocated a federal-type of government which, at that time, he simply called it Decentralization of the Government. Senator Manglapus could have been the best president we never had because of his progressive thinking. you forgot to mention Filipinos’ love affair with roosters, which are raised on perches as some sort of status symbol to crow long and loud at the early hours to show they’ve finally ‘arrived’, but all it says is that these are nostalgic traditions for a rural or jungle way of life that no longer exists but we’ll hang on to this one no matter what! in my barangay raising rooster gladiators is everywhere. even my girl officemate’s husband is into rooster-fighting. i can’t argue that money is big in these events though. urban cities like NCR / Cebu / Davao City / Bacolod should ban rooster-fighting as it is a place for white collar workers (mostly). i would suggest that raising roosters stay in farms. How to eliminate this old tradition? suggestions? please add here . . .
we need this type of education since most of our people are out of school (can’t afford to pay for it). watched the clip. Thanks for the link. Regular (= formal) education is better. The way you opt is making that generation, a lost generation. They wont be able to get a decent job. And it wont solve poverty. A nation can only be strong when that nation is empowered. they can’t afford formal education because of poverty. it’s better to have informal than nothing. they have something to do instead of doing nothing. and it also conditions their mind to learn. i want the formal education of Finland because it’s egalitarian. no such public or private schools. our children will be taught with same level, rich or poor. both will get the same education. a wishful thinking for our people. they would get jobs and avoid rooster fighting. it would slowly remove this culture. but rooster fighting is gambling just like UFC, Boxing, etc. it would never be removed anytime soon. Well it’s better than Drug Dealing tho. You might as well ban horse-racing. And probably every form of gambling. Abu sayyaf are not criminals — Duterte. Can someboy give DU30 a record of Abu Sayyaf activities since its inception? Looks like he’s VERY misinformed. I saw the video and this talk occurred in ARMM I believe. so I think he needs to talk like that because majority of the audience are muslims or it might be an Art of War tactic. The No Filter Mr. Duterte is definitely mistaken! Abu sayyaf are criminals! “might be an Art of War tactic”? For a while, I couldn’t see how this was related to the topic of this article; but maybe it is. I love Dinuguaan, but I’d prefer not watching cute innocent pigs squealing in pain while being butchered by a heartless Pinoy who looks like a dark-skinned version of Willem Dafoe on steroids. Yes, I must agree – this tradition of slicing off the heads of our kind decent guests that we have invited to enjoy “more fun in the Philippines” MUST START TO STOP. Way to go Mr. President. As for due process for the ASG – I’d say go ahead and kill em all without wasting tax money on court litigations. With all the millions in ransom payments they have already collected, they’ll just walk out of our courtrooms after bribing the judges and witnesses anyway. PS: talking of rights. We should be more concerned about the rights of poor chicken being battered to death as part of the preparation procedures in a dish called Pinikpinan in the Cordilleras & Baguio. Again, another tradition that needs to stop. Chicken with induced blood clots all around its body can be tasty, but where’s your humanity guys? Even atheists have a conscience. It’s common sense. A speedy death is the humane thing to grant to animals. For those of you wondering about how you will die in the future: Well I have come to the conclusion that what I mentioned in the article is the “best” way to die – completely painless: A bullet through the head while fast asleep in REM wonderland. Zero pain guaranteed. You’ll practically wake up in heaven (or hell, or whichever afterlife you believe in). So no – the bullet through Osama Bin Laden’s head wasn’t justice. it was an act of mercy – in comparison to all the pain he inflicted on so many lives. Yeah, I prefer hanging than lethal injection. Criminals deserve at least some ounce of pain. Now that’s justice. As what my philosophy teacher said, “No one/nothing is safe from change, the only thing you can’t change is change itself”. True that. The upcoming generations of Filipinos will definitely overhaul this society. How will it turn out? Only time will tell. Couldnt’t help but laugh at number 6. Oo nga naman. ???? Filipinos have customs and tradition. They are part of their mindsets. It is like their skins…they cannot jump out of their own skins. It will take many many years to remove those customs, and traditions. Some of these customs and traditions, were brought by the Spanish colonizers; to make the natives happy. We accepted them as part of our lives. Same as patronage politics…we cannot remove this custom ! Most will never find the real truth among Failipinos in the Failippines that are insecure or have egos to protect. Truth over time becomes either guarded or twisted as their perspective changes; it changes with the seasons of their shame, love, hope or pride. It is arrogant for Northwesterners or others to say that religion is nonsense. I do not have an organized religion – but respect others’ right to express their wishes of faith, as long as they are peaceful. Ironically, many leftists who criticize religion worship their own religion: government. Yes, these same people who criticize religion have adopted their own religion of government. This is replete, of course, with worship of cult-of-personality politicians, trite phrases they have been brainwashed with( and love to repeat over and over)as well as submission to their government of human gods. Their worship of these political gods involves more brainwashing, stupidity and idolatry than any modern religion I know of (except for one); therefore, stop casting stones and look into the mirror. One tradition in the Phils that I do not understand is letting boys’ hair grow out until the age of 1. I have been told it has something to do with good luck/health – but don’t know the details. Cockfighting, along with bull-fighting, is just a primitive tradition, unfit for any civilization. In the U.S. there are rodeos, which are the same thing. The rodeos are generally attended by low-intelligence/maturity rednecks. Rodeos involve the rednecks roping baby cows and whiplashing them at 25 mph, sometimes breaking their legs and, in some cases, necks. There are primitives in all cultures. You forgot to mention starting Christmas in September! What’s with that? Filipinos are only making capitalists rich by starting the celebration this early. Fiestas helps boosts the economy through tourism for instance the Panagbenga or Flower festival in Baguio that attracts many tourists. It also has a positive impact not always negative. And we don’t practice cooking a lot food during fiestas or opening our house to anyone who wanted to eat at those times. We don’t even cook anything for our relatives during fiestas. I guess that practice is not that popular in my hometown.